Just weeks after erroneously informing us that employment tribunal case numbers are “bouncing back following the slump after the introduction of fees”, on Friday the Law Society’s Gazette trumpeted that Acas early conciliation has “cut tribunal cases in half” since its implementation in April 2014. To be fair, the (very short) news report is a lot more accurate than its headline – so much so that you have to wonder which narcotic substance the sub-editor was enjoying at the time he or she came up with the headline. And perhaps it really doesn’t really matter whether a sub-editor at the Gazette knows the difference between ‘up’ and ‘down’. But if the self-proclaimed “publication of record to solicitors in England and Wales” can get so confused about basic legal matters, we can’t really blame less specialist news outlets (and politicians) for soaking up and repeating such canards. So it’s worth setting out in detail just how wrong that headline is. The relevant official statistics are freely available. And – especially if we put them into a chart – even Gazette journalists, with their uncritical eye, should be able to see immediately that the implementation of Acas early conciliation in April 2014 has not reduced the number of ET cases by anything like 50%. In January and February 2014 – by which time ET case numbers had pretty much stabilised following the introduction of fees in July 2013 – the average monthly number of new ET cases (single claims/cases + multiple claimant cases) was 1,922. And, over the three months up to March 2015 – the most recent months for which the figures are available – it was 1,626. That’s a reduction of 15.4% – which is slightly less than the 17% reduction predicted in the then government’s final regulatory impact assessment in February 2014, and a lot less than the 50% reduction now trumpeted by the Gazette. Furthermore, no one can say with certainty that all of that 15.4% reduction can be credited to the implementation of ‘mandatory’ Acas early conciliation. As noted previously on this blog, some ministers seem to believe there has been a significant ‘downward trend’ in ET claim numbers in recent years, as the economy has slowly recovered from the near-fatal shock administered by bankers in 2008. And, if they’re right, some of that 15.4% reduction would have happened anyway. So, how do we square this modest reduction of 15.4% with the fact – more accurately reported by Gazette journalist Chloe Smith in the body of her news report – that Acas is “preventing” about half of the cases notified to it under the early conciliation scheme from progressing to a tribunal claim? Well, one theory, previously set out on this blog, is that Acas is now hoovering up (and conciliating) lots of workplace disputes that would never have become a tribunal claim in any case. Which, it must be emphasised, is arguably a very good thing. It has always been clear that the overall number of workplace disputes (or potential tribunal cases) far exceeds the actual number of tribunal cases. And, even before the introduction of hefty, upfront fees, many potential tribunal claimants were deterred by the likely time, stress and cost involved – in March 2014, the then minister for employment relations, Jenny Willott, wrote: “it costs on average £1,800 to present a claim at tribunal”. And now it would seem Acas is helping to resolve some of those ‘non-tribunal’ disputes. Bully for Acas, I say. But the evident ‘success’ of Acas in hoovering up and resolving those ‘extra’ disputes is a separate matter to the (evidently modest) impact of early conciliation on the actual number of tribunal cases. And, of all people, journalists and sub-editors at the Law Society’s Gazette really ought to understand that. Will BIS meet the compliance challenge of Osborne’s Not-A-Living-Wage? So, George Osborne so enjoyed his upstaging of Labour on the minimum wage in January 2014 that he cunningly reprised it as the final flourish of last week’s Budget – without bothering even to consult the Low Pay Commission, that will now have the job of translating the Chancellor’s political con trick into a workable plan. (And, according to the House of Commons library, that may well require new primary legislation). In the days following the Chancellor’s flooring of Harriet Harman in the Commons, there was a small tsunami of newspaper comment pieces and blog posts seeking to analyse the deeper consequences, both political and economic, of the move. Among the more sanguine assessments were those by former Resolution Foundation wonk James Plunkett (The UK’s minimum wage just grew up) and the LSE’s Alan Manning (The National Living Wage: a policy experiment well worth trying), while even the Living Wage Foundation managed to utter a welcome through gritted teeth. For all this hullabaloo, Osborne’s second minimum wage coup actually didn’t advance very far on his first. In January 2014, he asserted that the UK “economy can now afford” a minimum wage rate of £7 per hour. Now – a full 18 months later – he wins acres of news coverage for committing to a rate of £7.20 from April 2016. Never have so many journalists and wonks got so excited over a difference of 20p. When it comes to employers, many sectors should be able to absorb this wage hike relatively easily, despite inevitable carping. But it will pose a severe challenge in some, above all in social care, where endemic low pay means two-thirds of all care workers currently get paid less than today’s [real] Living Wage. The truly heartening news is that more than 700,000 should now receive a pay rise. The worry is that if more public funding is not forthcoming to accommodate this increased wage bill we can expect an escalation in law-breaking by employers dodging their pay responsibilities, and an intensification of service rationing for the vulnerable. So, was there anything meaningful in the Budget to address this “severe [compliance] challenge” and likely “escalation in law-breaking by employers dodging their pay responsibilities” from April 2016? No, there wasn’t [but see comment by Craig Gordon and my response]. Indeed, as welcome as any significant hike in the minimum wage rate (except for the under 25s) must be, it’s very hard to see any underlying strategy on the part of the Chancellor, beyond providing a deeply cynical fig leaf for his poverty-inducing slashing of tax credits. Indeed, two months after taking office, the new crop of ministers have yet to give any indication that they consider compliance with the minimum wage to be much of a priority. It is now four months since BIS named any ‘NMW rogues’ under the ‘naming & shaming’ scheme revamped by the then (Liberal Democrat) ministers in October 2013. Which – according to the answers given by BIS to parliamentary questions tabled by Ian Murray in January and Caroline Lucas this month – means there is now a ‘backlog’ of some 340 employers to be added to the 210 named & shamed to date (under the revamped scheme, all employers issued with a Notice of Underpayment by HMRC get named & shamed, regardless of the circumstances and size of the underpayment involved). At the end of his answer to Caroline Lucas, BIS minister Nick Boles states that BIS “expects to name more employers shortly.” Which does at least suggest that ministers have not completely given up on the naming & shaming scheme. But either the next BIS ‘naming & shaming’ press release will be very long indeed (the largest to date included just 70 NMW rogues), or ministers will have to be more selective than the scheme provides for (e.g. naming only the ‘worst’ offenders among the 340+). And, from April 2016, that choice is likely to be even more stark. Lies, damn lies, and Acas statistics? One variant of the phrase usually (but erroneously) attributed to Mark Twain is that there are liars, damned liars and experts. Which is fine with me, because I claim no expertise in anything. So the first thing that struck me this morning, when casting an eye over the latest early conciliation statistics and independent evaluation report released by Acas, is that the good people in Euston Tower happily describe themselves as the “workplace expert”. Not that I dispute that description, and it’s probably worth stating at the outset that, like most people with an interest in workplace dispute resolution, I welcomed and supported the evolution of the early conciliation regime provided for in sections 7 to 10 of the Enterprise & Regulatory Reform Act 2013 from the pre-existing, Acas pre-claim conciliation service. An employment tribunal claim should always be a remedy of last resort, and any provision by the State to help resolve disputes without recourse to a time-consuming, stressful and costly tribunal claim is to be welcomed. So I’m glad that, 12 months after implementation of the early conciliation regime, Acas feels able to proclaim the regime a “success, with high take-up and satisfaction rates”. However (go fish, Mr Gove), the second thing that struck me this morning was the high number of early conciliation notifications (or ‘cases’) over the first year of operation – 83,423 – relative to the number of tribunal cases over the same period and, indeed, in previous years. In 2012-13, the last full year before the introduction of fees in July 2013, there were just 60,040 tribunal cases (single claims/cases + multiple claimant cases). So – in a desperate and probably doomed attempt to keep Gem Reucroft happy – I have put the quarterly Acas figures into the following chart. The green columns show the actual number of tribunal cases (single claims/cases + multiple claimant cases), while the blue columns show my projection of the number of tribunal cases we could have expected, had both fees and ‘mandatory’ early conciliation by Acas not been introduced. As previously discussed on this blog, this assumes a continuation of the modest ‘historical downward trend’ in single claims/cases that started in 2010, and about which the Ministry of Injustice – having somehow failed to notice it in 2012 and 2013 – now has so much to say. More controversially, perhaps, it also assumes that the sharp drop in multiple claimant cases in mid-2013 was largely coincidental to the introduction of fees, and simply reflects the slowing down (and confinement to Scotland) of what the Daily Mail would call The Equal Pay Claim Gravy Train. So it includes the actual number of multiple claimant cases. 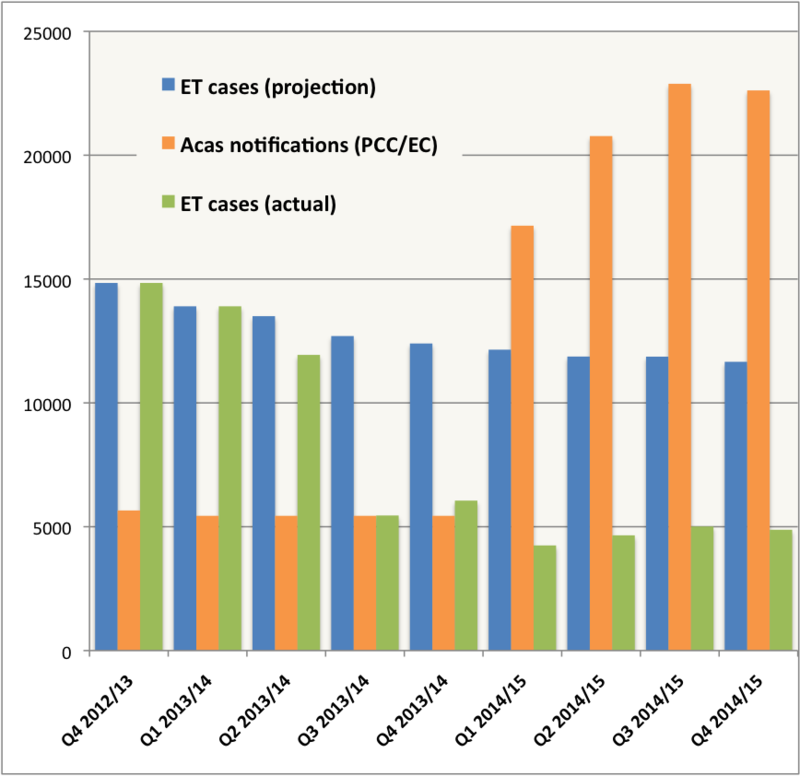 Finally, the orange columns show: (a) the average number of Acas pre-claim conciliation referrals, in each quarter up to Quarter 4 of 2013-14 (as I can only find annual statistics); and (b) the number of early conciliation notifications (or ‘cases’) in each quarter since April 2014. And from this we can see that the number of early conciliation notifications far exceeds not just the actual number of tribunal cases, but also the number of tribunal cases we could have expected, had both fees and early conciliation not been introduced. Indeed, in each of the two most recent quarters, the number of notifications was almost twice the number of tribunal cases we could have expected. From which we could perhaps conclude that Acas might well be hoovering up, and spending resources dealing with, a fair number of ‘disputes’ that would not have resulted in the issuing of a tribunal claim in any case. We probably need to take account of the number of voluntary pre-claim conciliation cases successfully resolved by Acas in the past before we do reach such a conclusion, but the chart suggests we may need to take a long, hard look at the assertion that the early conciliation regime introduced in April 2014 has been a “success”, at least in terms of reducing the number of tribunal cases (i.e. the principal aim of the policy). Acas states that the independent evaluation research “found that nearly half of all claimants (48%) who used early conciliation either reached a formal settlement or were otherwise helped by Acas to avoid a tribunal claim”. But if that 48% figure is applied to the total number of notifications in the two most recent quarters (45,498), the resultant number of potential tribunal cases left over (23,659) is only marginally different to my projected number of tribunal cases over those two quarters (23,526), had fees (and early conciliation) not been introduced. In other words, take fees out of the picture, and the introduction of ‘mandatory’ early conciliation by Acas appears to have had little if any impact on the number of tribunal cases. As noted by Darren Newman on Twitter (in response to the original version of this post), there is some evidence in the evaluation research report that Acas is indeed now hoovering up a significant number of cases that would not have resulted in a tribunal claim. The researchers found that one in four (24%) of claimants described their reason for making an EC notification as “being that they ‘Just wanted to see if a settlement could be reached, and did not have a desire to submit an employment tribunal claim'” (see page 33 of the report). Anyway, not being an expert, I’ve probably missed something rather obvious here. So I await a gleeful email or direct message from Michael Reed, following which I will rewrite this post.